A closer look at the new population data from the ABS shows just how attractive Victoria has become to interstate migrants, including interstate migrants from Queensland. While Queensland is still attracting interstate migrants, as I’ve discussed in earlier posts (Interstate migration to Qld remains low), we aren’t attracting as many as in previous years and we’re no longer gaining interstate migrants from Victoria. Indeed, we’re now actually losing people to Victoria (see chart below on net interstate migration – i.e. 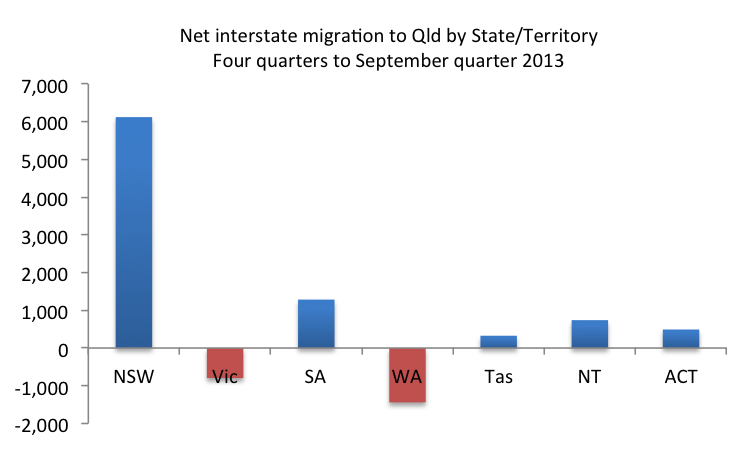 arrivals to Qld from a particular State less departures from Qld to that State). 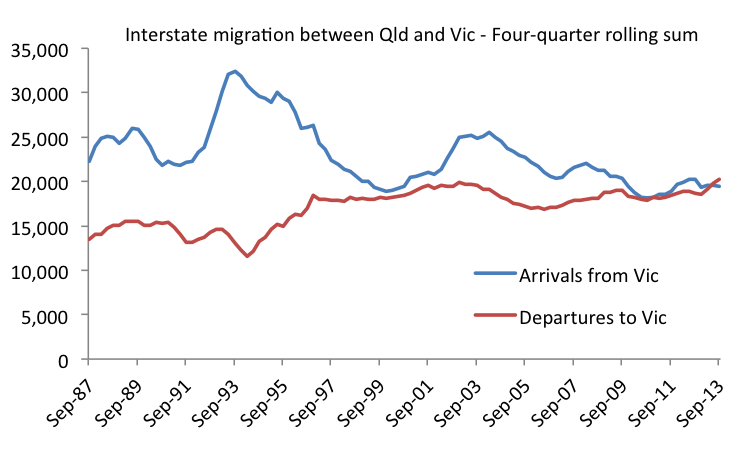 Arrivals to Queensland from Victoria have dropped over time, but departures to Victoria from Queensland have increased over time, and now slightly exceed arrivals (see chart below). I’ve written before about how Victoria is marketing itself much better than Queensland (Qld should look to Victoria for tips on tourism promotion). It appears many Queenslanders agree. Clearly career opportunities in Melbourne are an important reason to relocate for many people, but no doubt Melbourne’s reputation as a cosmopolitan city with great restaurants, cafes and bars is also important. This entry was posted in Migration, Population and tagged abs, interstatemigration, migration, qld, queensland, victoria. Bookmark the permalink. I haven’t seen an age group break-down on departures to Victoria – but I must say i have noticed that most of my co-hort of empty esters, are waving goodbye to their university graduate children to the cosmopolitan lifestyle of Melbourne, and professional intelligence based jobs that don’t involve extracting dirty resources out of a hole in the ground. There’s no age breakdown available for the quarterly interstate migration data from the ABS unfortunately, Katrina. But I suspect you’re right about the flow of graduates to Melbourne. Interesting post and as I have previously noted that big jump in interstate migration from Victoria in the early 90’s “recession we had to have” when Victoria was particularly hard hit. I wonder how much of the current trend may be repatriation including the university graduate children of previous migrants? Possibly some of the trend, but I think Victoria is becoming increasingly attractive to many Queenslanders, including those with deep roots in the State. SEQ certainly doesn’t seem as liveable as ten or twenty years ago. Traffic congestion is awful and the relative cost of living isn’t as favourable as it once was.